I am excited to tell you about April! April will mean my very last semester of graduate classes is almost finished! Our final will be May 9th. I will still have to complete and defend my thesis in the Fall semester because I’ve been going part-time, but there is a LIGHT at the end of this very long tunnel!! That being said, we still need to eat in the month of April. I changed Mexican Monday to Mediterranean Monday just to mix things up. I still have Quick-fix Tuesday, Do-over Wednesday, Leftover/Dessert Thursday and Movie Night Friday. It’s a fun menu and I hope you can get some use out of it! If there’s anything you need instructions for, you can find recipes on the April 2017 Menu Pinterest Board. 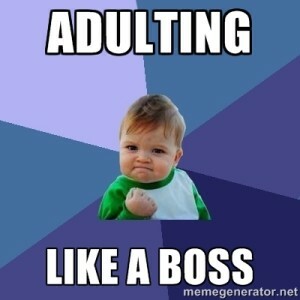 I have been seeing a lot of internet buzz about “adulting” classes. Organizations all over the country are offering classes to help young adults make the transition from being kids to being on their own. It got me thinking, OSU Extension Service has been offering these kinds of lessons all along, but maybe we are not getting the right audience! I was wondering, for my readers who live in or close to Lincoln County, is this something that is needed? If you think it is needed, would you come to an adulting class? What topics would you want covered? I am serious about these questions. Please give me some feedback. I would love to offer this type of program and I want to make sure the audience gets what is wanted/needed. Some of the topics I have seen being covered are budgeting, laundry, taxes, job interviews, housekeeping, writing a resume… So, what do you think? What are your thoughts? Don’t you just hate it when you have boiled eggs that won’t peel clean? It is really frustrating to try to peel a boiled egg and the egg white is coming away with the peel. My biggest tip to solve this problem is to peel the eggs under running, cold water. I always use a pasta fork to remove my egg from the hot water. Then I ceremoniously smash the egg against my kitchen counter and put it under cold, running water. This helps me to not burn my fingers and it also helps the membrane to release itself from the egg white. It peels much easier this way. My husband can grill an excellent steak. I mean, we do not go out for steak dinners because we are always disappointed. This is mostly because my husband can grill a much better steak than most chain-restaurant cooks. I asked him to give me his best tips for grilling the perfect steak. Here’s what he said. Season the steak well, but don’t over do it. We like to keep it really simple with a seasoned salt blend. Don’t fuss over it. Let the grill do its job. Just relax. Use a meat thermometer. A lot of people will tell you how you can check the done-ness of the steak by comparing it to the heel of your hand. This is a good way to end up with an overcooked steak. Just use a meat thermometer. For a rare steak, take it off the heat at 130. For a med-rare, take it off the heat at 140. For medium, 155. And for well done, 165. Lastly, let the meat rest. After the steaks come off the grill, let them sit on the counter top for about 10-15 minutes before you cut into them. Some residual cooking happens during this time. Enjoy your steak with some cream-cheese stuffed jalapenos, a good salad, and maybe a baked potato. My reason to workout- I could say I want to feel better, be healthier blah blah blah…. but the real honest truth is that we are going to the beach again for vacation this summer and I don’t want to be embarrassed in my bathing suit. It is the middle of March and to say I am struggling to keep up with the New Year’s Resolutions I mad back in January would be an understatement. This is the time of year when things get really busy at work, at school and with kids. It is the time of year when I am tired of my exercise program and I am tired from commuting to Stillwater for grad school. I am just tired and I am not keeping up! I am struggling and I need help to stay the course. Do you ever feel like this? Probably. Am I alone? Probably not. But what can we do about it? Here are my ideas, and hopefully I will take my own advice. Workout with a partner. You’re less likely to skip your workouts if someone is expecting you. Exercise first thing in the morning. I used to do this and it really helped. It’s nice to have that task checked off the list early. Maybe this is the one for me. Write it on your calendar- then put the calendar someplace you will see it. Find a program you enjoy. Don’t like running? Try yoga. Don’t like yoga? Try pilates. Don’t like pilates? Try kickboxing. Don’t like kickboxing? Try swimming…. Get the idea? Now, let’s all get out there and exercise! Get your storm shelter ready and make your tornado emergency kit. Today! Clean out the leaves and old spider webs. Make a kit with things you’ll need if you are stuck in the shelter for a few hours. Food, water, change of clothes, baby supplies, medications, a weather radio, a whistle, and a bucket… for, well, you know. You may also want blankets or jackets because these storms usually bring in cooler air and maybe a pillow for little ones who might fall asleep. Last night we had our first big thunderstorm of the Oklahoma spring season. We were actually under tornado watch and it reminded me that we have not cleaned out our shelter or made a kit. I gave an account of one of my less prepared moments a couple years ago. You can go back and read about how my family was caught off guard by the first tornado of the season and had to take the baby down to the shelter practically naked. I laugh at it now, but I don’t want to relive something like that.